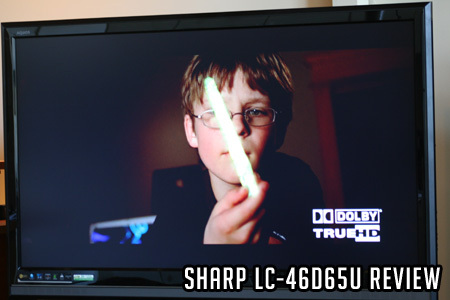 720p/1080i/1080p Picture Quality: The HD picture on the LC-46D65U was very defined once we calibrated the unit. There was a certain lack of depth as the picture information appeared somewhat flat to me. I believe this was caused in part by an overactive anti-glare screen, which also decreases the appearance of contrast in a brightly lit room. There was also a evident lack of dark shadow detail. Color information appeared natural and not over saturated. Note the lack of dark shadow detail in this HD image from The Last Mutiny. 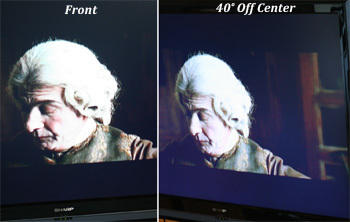 Up conversion from 480i and 480p: The Sharp has stellar processing in some cases. 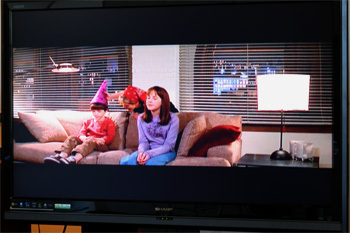 Horizontal and Vertical line information was displayed with no dithering in our HQV Film Resolution Loss Test. The processing was better than even many very high end TVs and one of the only units testing that did not exhibit strobing during this test in any of the test boxes. Up conversion from a 480i signal was solid but the picture went a little soft. With a 2:35:1 DVD one needs to use the Zoom aspect ratio feature which weakens definition in the picture even more. The blinds in the background in this scene from Step Mom displayed with no dithering movement and artifacts. This is an impressive result verifying excellent internal processing boards. Black Level: Black levels appear solid from front and center but off to the side at 40 degrees blacks begin fading to a dark purplish hue and this effect remains at further angles. Note the difference in the top and bottom bars from the front and at a 40 degree angle. In the picture at right from this scene from Perfume it's easy to note the dark purple hue creeping into blacks. Dark Shadow Detail: The LC-46D65U had relatively weak dark shadow detail which would be expected with the deficient contrast ratio we tested. See Calibration measurements and contrast here. 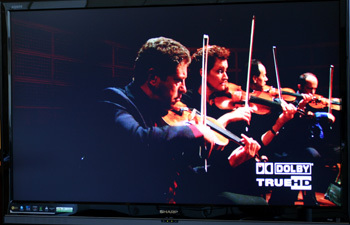 The LC-46D65U struggled with dark shadow detail as in this scene from The San Fransisco Philarmonic playing in our Dolby Test DVD. Note the lack of detail in darker areas of clothing. Color Rendition/Color Accuracy: Once calibrated, color information on the LC-46D65U appeared realistic and vibrant. 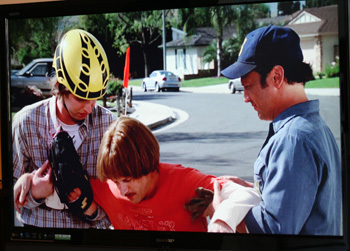 We felt colors were very realistic overall but that flesh tones were slightly washed out as in these two scenes from the HD version of comedy Benchwarmers. Viewing Angle/Off Axis Viewing: As noted in black level section above, contrast begins to degrade at around 40 degrees on this LCD. Sharp is known for having high quality LCD panels which they manufacture at their own factories, so I was surprised at this result. We suspect it has to do with the anti-glare screen contained on this LCD. Motion Lag: With fast motion the Sharp performed very well for an LCD, displaying the increased response rate present on this model to 8ms. In scenes when the camera panned from side to side there was obvious jerkiness as if there camera was hitting bumps along the way. Though this is common with LCD TVs, it is never pleasant. This was also apparent in our HQV Stadium seating test. No moire' pattern appeared but the jerkiness as the camera tracked from one end of the stadium to the other was apparent. False Contouring/ Mapping: There was some false contouring and mapping apparent in 480i test content. Lack of detail in dark areas also accentuated blotching. Exceptions: While the anti-glare screen on this LCD does reduce a lot of glare from ambient lighting, it causes contrast and black levels to degrade at early angles. Video Aspect Ratio Sizing: With most inputs there are 4 options S. Stretch, Zoom, Side Bar, Stretch. You will want to use the Zoom setting for 2:35:1 DVDs. With HDMI input signals there is the addition of Dot by Dot and Full Screen options. The Sharp manual gives excellent instruction about which setting to use with varying content. 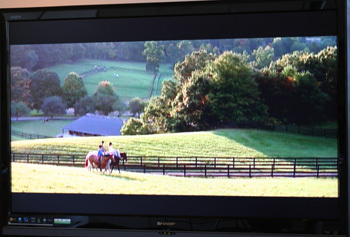 Using the Zoom setting while viewing the 2:35:1 480i DVD Step Mom rendered images a little soft as in this picture of the horse farm. Notice the blurry edges around the horses. Inputs: As with most all TVs these days the Sharp has plenty of inputs. There are 5 HDMI inputs with one of these housed conveniently on the side of the TV. There is also a USB port placed there which allows the user to quickly load and view pictures or other content. To see the full input options for the LC-46D65U click here. Aesthetic Considerations: The Sharp LC-46D65U scores very well in this category with nice clean lines and small non-distracting bezel. There is a thin gray metal speaker grill strip accented in the bottom of the unit. We measure the depth at an impressively sleek 3.8" making this TV ideal to wall mount. Remote Control/Menu Functionality: There is a convenient set of controls placed on the side of the TV, out of view, but easily accessible should you misplace your remote control or need this option for a trade show. The accompanying manual gives clear instruction. Audio Output: The Sharp had good voluminous sound and relatively crisp compared to most inbuilt speakers. It had good pop in the high and mid ranges as we could even discern fret buzz during replay of our Dave Matthews Dolby Digital test DVD. The bass however was weak even with the bass enhancer feature cranked all the way to 10. Overall though I thought the audio performance for TV speakers was excellent. Price/Quality Considerations: On a quality comparison with the nearest competitors we would pit this Sharp LCD more squarely against LG, Mitsubishi, and Samsung. The Samsung LN46A550 is priced about the same as the Sharp LC-46D65U at around $1150 and we put the quality comparison of these two units in the same ball park. The Mistubishi LT-46148 is priced just above those two at $1200. The LG 47LG50 is priced just below at $1099. This Sharp offering is priced right.